Madrid needs a second airport to guarantee air connectivity, boost industry growth and respond to demand. Why a second airport in Madrid? Madrid is the only European capital city with just one airport for a population of almost 10 million. The metropolitan areas of London and Paris have one airport for every 2.5 million and 3.75 million inhabitants respectively. Madrid’s metropolitan area has a population of 7.8 million but Madrid Barajas Airport’s wider area of influence covers around 9.4 million people. Passenger traffic will double over the next two decades. According to studies published by IATA, the number of airline passengers will have doubled by 2036. There is a pressing need to put the airport infrastructure in place now so that it is ready to cope with the forecast growth well in advance. Madrid Barajas has the lowest ratio of flights operated by new generation airlines 1 in Spain and Europe. Low cost air travel is recording the highest growth in Spain (+4.6%) in contrast to the -5.3% decline in traditional aviation (2017). In Madrid Barajas low cost airlines only account for 32% of all operations. Their share of operations is as high as 69% in Prat-Barcelona Airport, which is currently Europe’s fastest growing airport for new routes. 1 New generation airlines: low cost carriers operating efficient aircraft under an optimised management model. Madrid badly needs airport infrastructure that will enable the successful development of executive aviation and so guarantee the city’s positioning as a leading economic European capital. Casarrubios-Álamo Aerodrome is located 30km from Madrid. Road connections have already been built so no additional public investment is required. Suitable terrain for the infrastructure. Madrid South Airport: An alternative and complementary airport to Madrid Barajas. The airport will be developed on the basis of the extension of the existing Casarrubios-Álamo Aerodrome, Madrid’s primary infrastructure devoted to general aviation. The aerodrome currently records an average of 70,000 operations/year, has 25,000m2 of hangars, more than 300 resident aircraft, 50 air services companies and around 3,000 users. 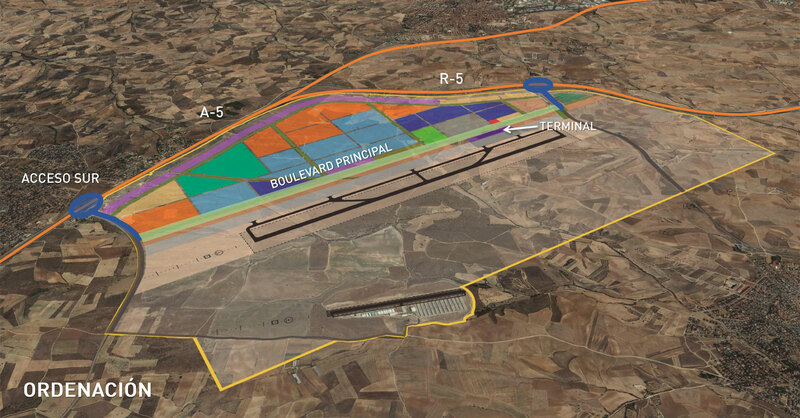 Madrid South will be a commercial airport specialising in new generation carrier operations. It will have a 3,200m runway, a 15,000m2 terminal in phase one of the development and a further 50,000m2 will be set aside for aircraft maintenance and hangarage facilities. In addition, Madrid South will be home to executive aviation and air cargo operations and the existing Casarrubios-Álamo Aerodrome runway will be extended to 1,500m in order to develop general aviation activities. Madrid South will be generate a source of much needed industrial growth and jobs in the surrounding area. The airport project will be rolled out on the basis of modular investment and environmental sustainability criteria. An initial investment of around €150m is planned in the first phase of development with full investment potential of €1.95 billion achievable over the next 25 years. 12,500 jobs generated for the airport city construction, urbanisation and building development. Passenger traffic growth is forecast to double in volume over the next 20 years. The new airport will mean air connectivity in the Madrid area and the centre of the Spanish mainland will be maintained if any contingency were to force Barajas Airport to close temporarily. Not only will Madrid South not compete with Barajas but it will also be a complimentary infrastructure project that will allow AENA’s airport to consolidate its position as a hub. Furthermore it will encourage the opening of new international routes by attracting some of the traffic from low cost carriers that prefer a different kind of airport: smaller, more flexible and more economical. Road connection infrastructures already exist with the A5 and R5 major highways surrounding the infrastructure. The airport will be in a prime location to boost the south-west axis and help to promote the Madrid Region and the Castilla-La Mancha Region with its lower employment and industrial activity rates. This initiative is driven by recognised aviation industry companies and requires no public investment. It represents a strategic general interest project for industrial development and job creation.